I had the idea that it might be nice to use the board for a collective practice support thread and that a good way to structure it may be the Seven Branches. We can use this space to make confessions, rejoice, request teachers to remain and teach etc. Take your seats on these cushions of lotus, sun and moon. We offer homage, while devotion fills our body, speech and mind. We make offerings, outer, inner and secret. We confess all impairments and breakages of vows, all our harmful actions and obscurations. We rejoice that the secret mantrayana is being accomplished in practice. 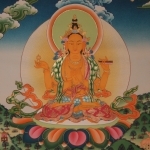 We request you to turn the wheel of the secret mantra teachings, which ripen and liberate. Remain with us without passing into nirvana, we pray. We dedicate all merit so that sentient beings attain the essence of enlightenment. May we all realize our true vajra nature! Last night while playing Dungeons and Dragons I had a lapse of mindfulness and spoke harshly with my partner. It was unskillful and unbecoming of a practitioner of Mahayana and lead to an argument and suffering. I confess this lapse to the three jewels publicly and wholeheartedly in an effort to purify negativity and cultivate virtue. Where do I start? Do you have a few days? I bet we could set a record for the longest thread. Sometimes I loose my patience. I'm angry a lot. I've managed to keep it from spilling out onto others most of the time, but every now that and then I yell at my kids or get in some inane argument with my wife. Lately I speak harshly towards others when they can't hear it. usually irrational stuff in traffic jams and whatnot. I criticized my Vajra Sister about not caring about her vows or samayas through facebook messenger recently (I have learned one should just politely ignore and avoid such people). I have been very critical and harsh to people for most of my life, specifically my parents. I don't practice enough as I should. I also have a really bad habit of rationalizing non-virtue. I confess these lapse to the three jewels publicly and wholeheartedly in an effort to purify negativity and cultivate virtue. Thank you all for your contributions thus far. Its humbling to witness your honesty. The ethical quandaries of DND are no joke!